Budbud fried rice originates in the province of Rizal. It is a fried rice, usually colored with soy sauce or the likes, topped with scrambled egg, onion spring, tomatoes and meat or fish. It is a one meal dish. I first got a taste of it at food stand in Tiendesitas and you can pair it with barbecue or other viand. Though I think it’s not authentic, it really taste good. 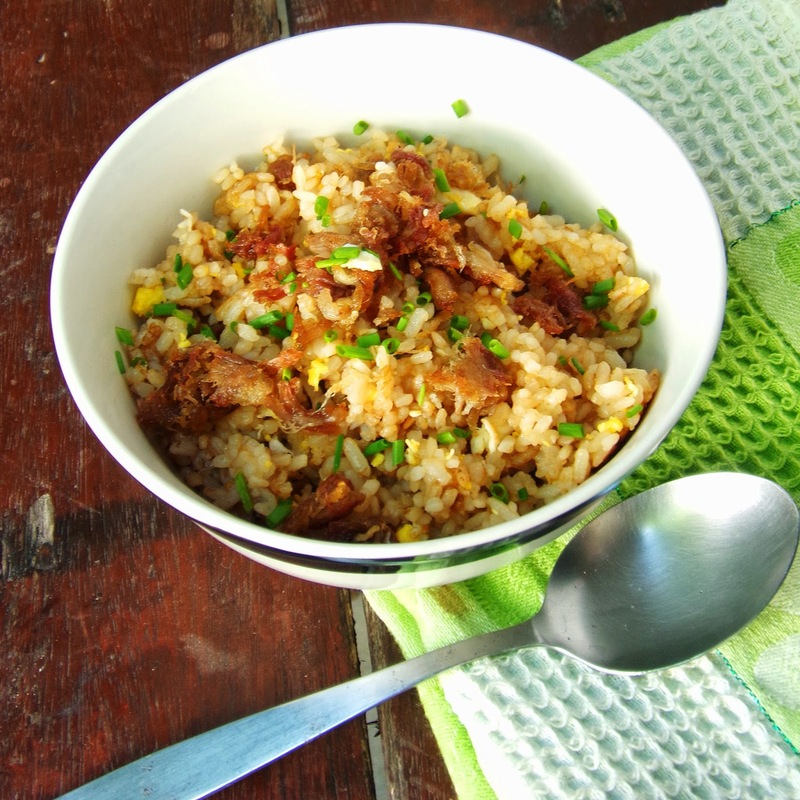 About three weeks ago, I had four straight breakfast of preparing my own budbud fried rice. I prepared it using soy sauce and eventually I found oyster sauce much more tastier to use. This morning, I had a sudden craving for this delightful dish to fuel my day. Initially I just wanted to topped it with scrambled egg and garnish with onion spring but I found some chunks of tender pork meat in the fridge form our last night’s nilagang baboy. Okay, this is great I told to myself. I simply wash the meat with water and shred it using my hands. Then, I fried it until crispy and topped it with my budbud fried rice. It turned out a one bowl dish. Everything is in it. The best part, the the shredded pork meat turned out really crispy and it added a crispy texture to the dish. Heat pan and add vegetable oil. When hot, add shredded pork meat and cook until brown and crispy. Set aside. Heat a separate large pan and add vegetable oil. Cracked the eggs and season with salt. Immediately mix using a wooden spoon. When the eggs are cooked, simply chopped it with a knife or just use the wooden spoon to turn the eggs into bits. Set aside. Using the same large pan add the rice. I did not add anymore oil since I’m using a non-stick pan. Season with salt and mix the rice. Cover the pan for 3 to 5 minutes just to melt the salt. Add the oyster sauce and mix until the the fried rice is equally colored with the oyster sauce. Add the crispy pork meat, eggs and garnish with chopped spring onions. you may also served this with chopped tomatoes for more authentic experience.